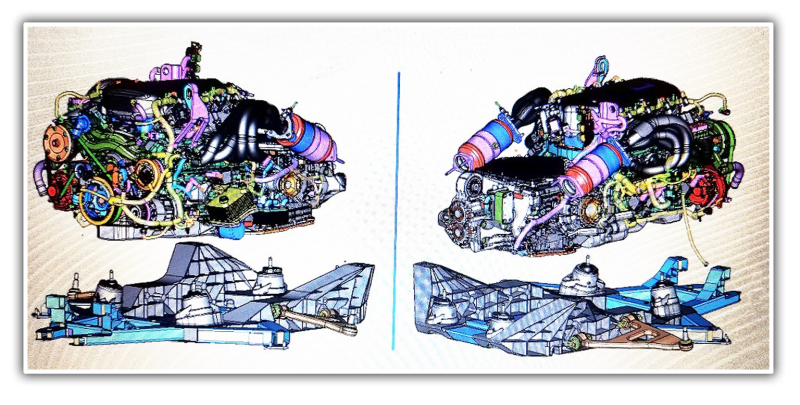 A number of images purporting to be CAD designs of what’s been dubbed the “mid-engine Corvette” leaked last week, but despite how real they looked, there was no way of knowing for sure if they actually came from someone affiliated with General Motors. Until now! Late Friday, a lawyer working on behalf of GM inadvertently confirmed that these drawings are real. -Magshocks (or spool valve, either way, fancy shocks). -Upper front arms look to be similar to C5/6/7 with trunions. -Lower front arms look to be similar to C5/6/7 with camber eccentrics. -Rear subframe is HUGE and is a very strange mix of cast parts and welded tube. Can’t tell if it’s welded or bolted together in the middle. -Looks like factory shorty headers instead of cast manifolds. -Not sure what the upper-right accessory pulley is for. Upper left is water pump, lower right is AC. -Oil filter looks easy to get to. -Oil cooler clearly shown above filter. -Half-shafts look to be the “bolt on flange” style (no draining trans to remove shafts). -That transaxle is BEEFY. Like, dear god. Can’t tell if it’s auto or manual. If I had to wager, that’s the automatic (guessing from shape of bottom of trans and what looks to be coolershanging around it). -Giant flat space above transaxle is more than likely for intake box/filter. -Frame looks to be similar to C5/6/7 with giant hydroformed rails (probably still aluminum). Disppappointing. I was hoping for proper unibody. Hopefully with a fixed roof it’ll be stiffer. -Brake rotors are 1 piece. Calipers are MASSIVE. -Side skirts are mechanically fastened just like C5/6/7. Still going to be horrendously expensive to fix if damaged. But all of this stuff was little more than an unusually detailed rumor. Still, a rumor can be sourced in truth, and it appears a GM lawyer confirmed at least the provenance of the photos—by asking us to take them down. Late last week Jalopnik received a notice that GM would like us to remove the original article, as said article contained “copyright artwork” that was claimed by a lawyer for GM. By claiming copyright ownership over the images sent to Facebook, GM acknowledges that it is the source of the images, and thus we believe the images to be newsworthy and fit for publication. We’ll be keeping the CAD images up in the meantime. All of the evidence combined points to a mid-engined GM product, coming in the near future. Thanks, lawyers!